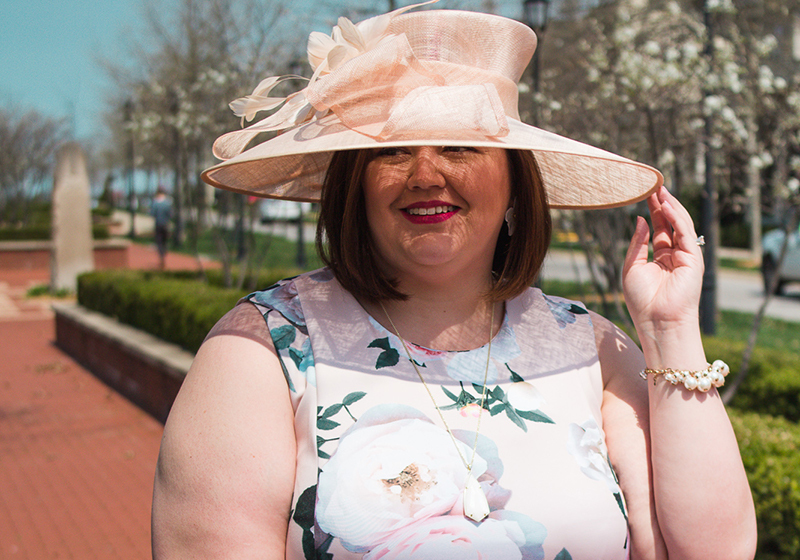 Last week I had a last-minute invite to attend the Kentucky Oaks. For those not from these parts, the Oaks is the equivalent of the Kentucky Derby for the fillies (lady horses). It's held the day before the Derby, and is part of the festivities. The race is nicknamed “Lilies for the Fillies” as the winner is draped with a blanket of Lilies (versus roses during Derby). In keeping with my desire to “stop scrolling and start doing,” I jumped at the chance. A day in the beautiful spring Kentucky weather with friends and the chance to wear something on my noggin? YES PLEASE! You'll see a wide variety of clothes for the Oaks, but nearly everyone wears pink somewhere – even just as an accessory. It is THINK PINK day and a donation is made to Bright Pink. I only had 2 days to find an outfit with pink (because I love a theme!!) and a hat to go with it. After looking online, I saw a Lela Rose for Lane Bryant dress that was white and pink. I didn't have enough time to order online, so I ran to the store and crossed my fingers in hopes they'd have it. They ended up not having that specific one, but they did have this watercolor one that was sold out online. Score!!! I then went to the adjoining Macy's and they still had a wonderful array of hats and fascinators. I ended up choosing a fascinator (this one is on a headband) since I have a large noggin and hats usually don't fit me. The color match was perfect! I almost wore new pink shoes I also purchased at Lane Bryant, but then remembered I'd be on my feet walking a lot, and went for my old standby yellow Cole Haan wedges. I think they're probably 5 years old. If I could find them still in 11 Wide, I'd buy them in every color of the rainbow. The fascinator was super comfortable and the lovely sales woman at Macy's taught me to wear it more forward on my head than back like a headband. She was totally right. Hat master. I won on the first couple of races I bet on, but for Oaks I lost. My handicapping skills need work! It's been a little quiet on the blog lately as my schedule has gotten a little hectic. I hope to pick up the writing more this week.